Phnom Penh, Dec 4 (Just News): Bangladesh today sought Cambodian support towards a "durable solution" to Rohingya crisis as Prime Minister Sheikh Hasina held official talks with her Cambodian counterpart Hun Sen.
"As we continue our bilateral negotiations with Myanmar for Rohingyas' safe return back to their homeland, I requested Prime Minister Hun Sen for his support towards a durable solution of the crisis," Prime Minister Sheikh Hasina said while delivering her joint press statement with the Cambodian premier at the Peace Palace after the official talks between the two countries. The Bangladesh prime minister said during the talks they discussed some of the emerging security challenges facing the region and expressed their common resolve to fight terrorism and extremism. "We've also discussed the Rohingya crisis that threatens peace and stability of our region. Bangladesh continues to shelter more than 1 million Rohingyas, among them around seven lakh Rohingyas fled atrocity in Myanmar and took shelter in Bangladesh recently. The Cambodian prime minister said they discussed the issue of Rohingya people from Myanmar which is really a burden for Bangladesh. Hun Sen also expressed his hope that both Bangladesh and Myanmar would work together smoothly for the safe return of the refugees back to Myanmar. "We highly appreciate Bangladesh for giving shelter to the Rohingya people even though Bangladesh has a population of over 160 million. Bangladesh took the issues of refugees on its shoulder," he added. Describing Cambodia as a close regional neighbour of Bangladesh, the Bangladesh premier said the two countries share common aspirations to promote peace, security and development. "We cooperate closely in many regional and global fora, including at the ARF, ASEM, ACD and the UN," she said. She termed her visit to Cambodia has been extremely fruitful and said Prime Minister Hun Sen and she remain committed to taking Bangladesh-Cambodia relations to all new heights and dimensions. The premier commended Hun Sen for the robust growth and development of Cambodia. "During our official talks this morning, we discussed the entire gamut of our bilateral relations in a warm and cordial atmosphere," she said. Sheikh Hasina said a major focus for Bangladesh this time was to intensify trade, economic and technical cooperation. "We have signed 10 bilateral agreements and MoUs during this visit," she said. The prime minister said Bangladesh has proposed holding of the first Joint Commission to be headed by two Foreign Ministers in Dhaka next year. "We have decided to hold the first meeting of the Joint Trade Council (JTC) to be headed by two Commerce Ministers next year," she said. Sheikh Hasina said Bangladesh and Cambodia are also considering a proposal for opening of resident diplomatic missions in each other's capital. "I believe that signing of the MOUs on the JTC, on investment promotion, and the agreement between our two apex chambers, will contribute to boosting of bilateral trade and investment," she said. She said the MoUs signed on technical cooperation in the areas of labour and vocational training, ICT, fisheries and aquaculture and tourism will foster multi-dimensional cooperation. Pointing out that regional cooperation has also received major focus in today's discussions, she said she is happy to receive Prime Minister Hun Sen's assurances of support to Bangladesh's Sectoral Dialogue Partnership aspiration with ASEAN. "As a Ganges basin country, Bangladesh also looks forward to working with Cambodia towards our membership aspiration at the Mekong-Ganga Cooperation Forum," she said. Sheikh Hasina said the people of two great nations endured similar sufferings of mass atrocities and genocide. "Bangladesh peacekeepers were among the first to stand next to the Cambodian people during their post-conflict peace-building," she said. The premier said the Bengali and the Khmer nations share ancient cultural linkages, a Sanskrit and Pali inspired script, and a common new year in the month of April. Mentioning that she paid respects to the Norodom Sihanouk Memorial, she said the King Father of Cambodia is held in high esteem in Bangladesh. "I'm very happy to announce that my government is naming a prominent street in our capital Dhaka as a mark of respect to Late King Norodom Sihanouk." Extending her sincere thanks to Prime Minister Hun Sen for his hospitality, she said this visit would go a long way in taking Bangladesh-Cambodia relations to new heights. "I offer my very best wishes for his good health, long life and happiness, and continued peace, progress and prosperity of the friendly people of Cambodia," she said. The Cambodian prime minister said, "In the bilateral discussions, we've a very fruitful result in which we're looking forward to work together to becoming developing countries." He said that Cambodia supports the request from Bangladesh to be the sectoral dialogue partner of ASEAN while Phnom Penh will also work to achieve this goal. Hun Sen expressed his heartfelt thanks for all the support that Bangladesh extended to the people of Cambodia. He also noted that through this 2nd official visit of Bangladesh Prime Minister Sheikh Hasina to Cambodia after her first one in 2001, the bilateral relations of the two countries would be further strengthened. 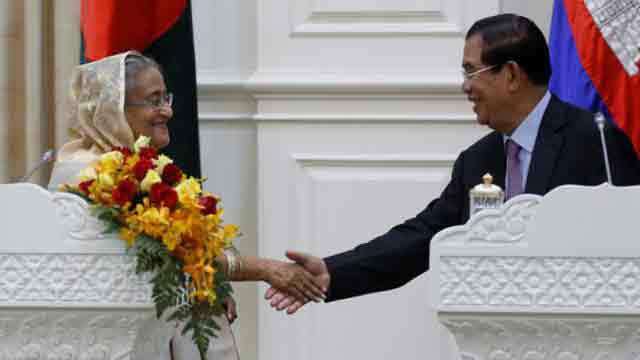 The Cambodian prime minister also expressed his gratefulness to Sheikh Hasina for the invitation extended to him for the return visit to Bangladesh saying, "I accepted it with pleasure." The Bangladesh side that took part in the talks included Civil Aviation and Tourism Minister Rashed Khan Menon, Foreign Minister AH Mahmood Ali, State Minister for ICT Division Zunaid Ahmed Palak, PM's Principal Secretary Dr Kamal Abdul Naser Chowdhury, Chief Coordinator on the SDG Affairs at the Prime Minister's Office Md Abul Kalam Azad, Foreign Secretary M Shahidul Huq and PM's Press Secretary Ihsanul Karim.